My family seems to bond best when our lives are in danger. Once, when we got ourselves in over our heads scaling a rocky mountain and had to climb over a terrifying precipice, one of my sons actually said, “I love you guys” as we gripped his sweaty wrists and dragged him to safety. It was incredibly sweet. 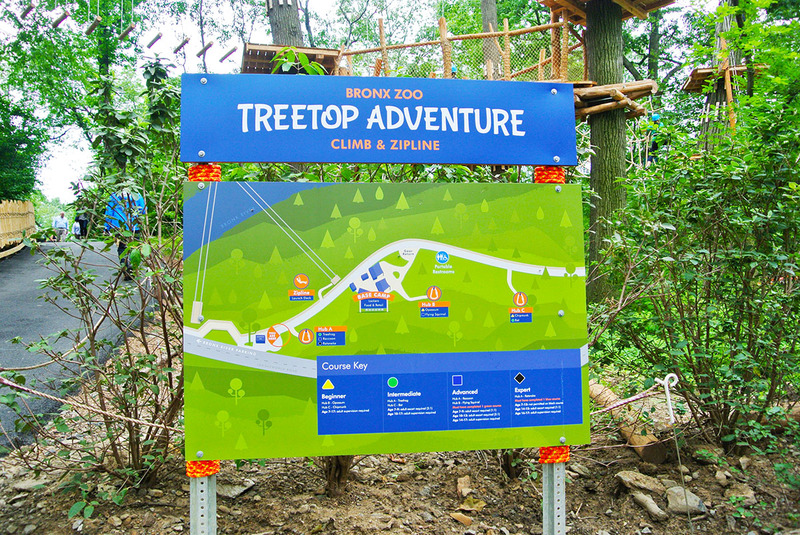 Which is why I was never too tempted to visit the Bronx Zoo’s Treetop Adventure, which opened last summer and includes an aerial obstacle course and a 400-foot zip line over the Bronx River; I doubted how “adventurous” it could really be and imagined an overly cautious simulation experience, like the hot-air balloon ride at Disney that’s actually tethered to the ground. My twin 11-year-old sons were skeptical, too. But on the recommendation of a friend, we finally gave it a try and…we were wrong! While we were never at risk of plunging to our deaths (oh, well), maneuvering through the swinging wood planks, tightropes, shaky ladders, and Tarzan swings was enough of a challenge to get our adrenaline going. 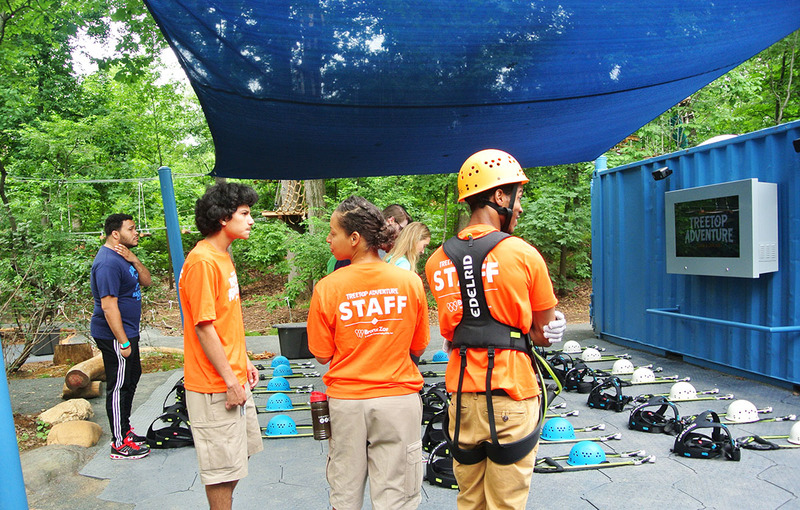 After an introduction to the safety protocols, we were instructed to start with a beginner course, before moving on to the three harder levels (intermediate, advanced, and expert). We were cocky, of course, and skipped straight to an intermediate route, which definitely made us sweat under our helmets. Trailing us on the course was a teenage brother-and-sister duo who looked shell-shocked. “We accidentally tried the expert level,” the sister admitted. “Don’t do it, man,” warned the brother. Naturally, we headed straight there. But because the expert courses have a minimum age requirement of 14, we had to settle for an advanced path which, as it turned out, was advanced aplenty. OK, and so what if we did need a rescue? It wasn’t really our fault. 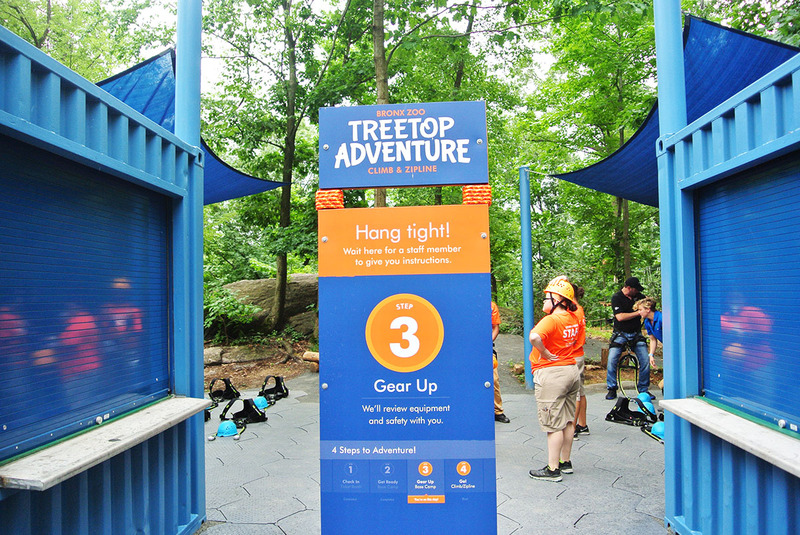 My svelte sons’ weight was not enough to carry them through the zip lines on the course and, at one point, they were both stuck, suspended over the zoo entrance road on two separate lines, the visitors below pointing and laughing. We almost died (of embarrassment). It was incredibly sweet. Solve a murder mystery at the Metropolitan Museum of Art with Watson Adventures’s Whodunit at the Met Family Scavenger Hunt (kids 10 and older). For those headed to the U.S. Open, hit these six very cool things to do nearby when the littles get sick of tennis. If your kids have grown out of their bikes (can’t they stay the same size for, like, one whole year?! ), try your luck at the Brooklyn Bike Jumble, where bike vendors from all over sell used, overstocked, and discount bikes. It’s held at the Old Stone House in Park Slope’s J.J. Byrne Park, so even if you don’t find new wheels, you can always play on the monkey bars and get gelato across the street at L’Albero Dei Gelati. There are only so many warm-weather weekends left to visit Governors Island—and see the Jacob Hashimoto otherworldly art installations peppered around the island—before it closes for the season on October 31. Do your kids love tea? Probably not. But they might like the giant pink Bobas and other Instagrammable scenes at the immersive pop-up Room for Tea.